If you've got an eye for a target why not have a go at archery? If you're not familiar with it, archery is a shooting sport involving bows and arrows. Most archers participate in target and field archery, but some prefer hunting archery. As the name suggests, target archery involves firing arrows at targets. Competitions can take place in indoor or outdoor conditions, but the distances are not the same in each case. For indoor competitions, distances are usually 18m and 25m, whilst for outdoor competitions, they are 30m and 90m. Competitions are divided into ends, which last for three to six arrows. After an end, you must collect your arrows from the target in order to score. The target is a board marked with 10 rings, all of which have the same space between them. Scores for landing a target on each ring vary from one to ten. If an arrow lands on the line between two rings, the higher score will generally be given. This is known as a line breaker. At outdoor tournaments, there is an inner 10 ring, which is also known as the X ring and is used in a tiebreak situation (with the archer who fires the most arrows on the X ring winning the tiebreak). In indoor tournaments, the X ring doubles as the 10 ring. Field archery is similar to target archery, but it usually takes place on more harsh ground and involves different targets. A round is made up of 28 targets that are separated into two units of 14. There are three main types of round: field, hunter and animal. For field rounds, targets are placed at even distances of up to 80 yards. Targets have a black bull’s-eye (worth five points), a white central ring (worth four points) and a black outer ring (worth three points). For hunter rounds, targets are placed at uneven distances of up to 70 yards for adults, and between 30 and 50 yards for children. The target is slightly different to the one used in a field round (black with a white bull’s-eye), but the scoring system is the same. For animal rounds, life-size 2D targets are placed at uneven distances, similar to the hunter round, but the rules and scoring are not the same. At the first station, you must fire your first arrow. If this misses, you advance to the second station, and so on. Scoring is either vital (20, 16, 12) or non-vital (18, 14, 10). Points are given depending on which arrow scored first. You are normally required to wear a bracer, which is also known as an arm-guard. This protects the inside of the arm that you use to shoot the bow, and stops your sleeves being caught in the strings of your bow. Chest guards are an optional safety extra, but they stop your body and clothes hindering the bowstrings when you release your bow. They can also protect you against out-of-control arrows that may be accidentally flying around the course - unfortunately, this is quite common if beginners are in the vicinity! 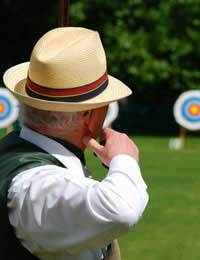 Gloves are advisable, as it's easy for your fingers to slip on the bowstrings as you fire, especially if your hands get sweaty. These are often made from leather. Some archers also choose to wear thumb rings. Archery can be a fun activity if you’re looking for something a bit different. It’s often offered as a leisure package (along with activities like paintballing, go-karting, offroading and quad biking), or you can round up your workmates for a corporate archery experience.